So I don’t know about you, but games in The Legend of Zelda series are some of my favorite games. I remember The first time I saw Phantom Ganon burst out of the paintings in the Forest Temple. Enjoying the amazingly beautiful animation of Wind Waker (I’m talking to you, wobbling Moblin lips!). But for years I have told people that by far, my favorite Zelda game has to be A Link to the Past. And then Nintendo announced some exciting news! I know everyone loves the 3D Zelda’s, but there is something about the sprites, the story, the plethora of items… I just absolutely love A Link to the Past. And when Nintendo announced a sequel to A Link to the Past, I felt like a kid again. Not a remake, not a re-release, but an honest, true sequel to one of my favorite games of all time. (Actually, after typing the above lines, I read that it is not a true sequel, but takes place in the same Hyrule, but a different generation of Link and Zelda). I am trying my best to not read too much about the game. I still remember the excitement and mystery of buying a new video game when I was younger, knowing just enough to make you excited, but not too much to spoil everything. I feel like nowadays, video games and movies take so long to come out, that by the time they are released, you can practically see and watch a huge portion of the game. So I am going to try and remain in the dark about A Link Between Worlds so that it is as mysterious and exciting as it can possibly be! 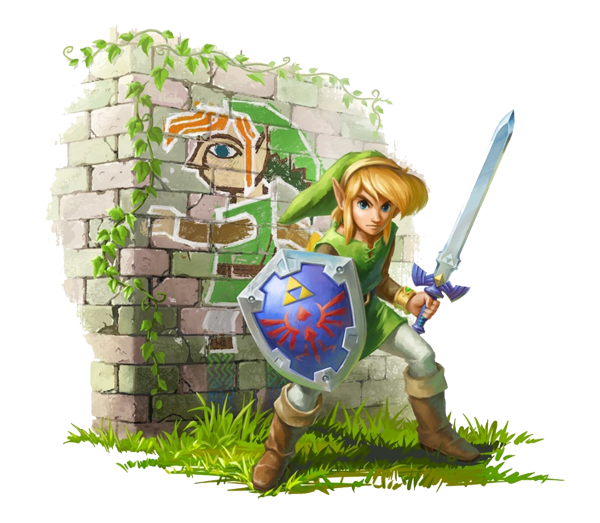 In celebration of this November’s release of The Legend of Zelda: A Link Between Worlds, I am planning a new Link costume, hopefully in time for Dragon*Con. With my previous Link costume, the goal was to recreate the Twilight Princess look, but to make it more realistic and practical. But with this new Link costume, I am trying for as accurate to the game as possible. Thankfully in the concept art, Link isn’t a young boy, so I don’t feel that my age works against me too much with this costume. The fabric has been ordered, the ideas are being discussed, and we will be posting updates as this costume moves forward. And isn’t it perfect that our Anime ears are exactly what I need for this costume, the right size and shape. Thanks, Nintendo!